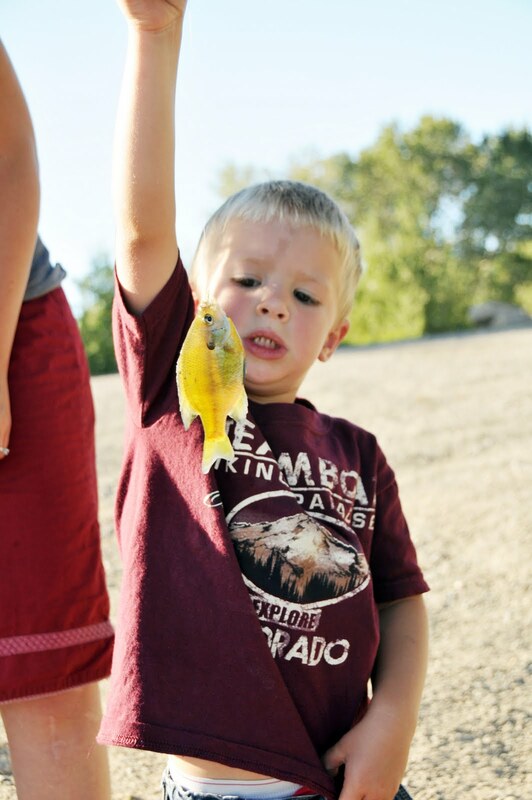 We went fishing to Highland Glen park and Gavin caught this little beauty. He was so excited, and wanted to take it home to eat. But as you can see, it was pretty small, so we let it go. I think we found ourselves a little fisherman. I put Gavin in swimming lessons and he loved it! Every day he would tell me, "Mom, when it is time for swimming lessons, say 'Gavin, lets go to swimming lessons!'". He wanted to make sure I never forgot! When we would get there, he always tried to find his teacher, and wouldn't get in until his teacher acknowledged he was there. He does really good following his teacher. And when it is time to go, he has to make sure his teacher says "bye" to him. He's a pro at that, he can do it really fast! Oh...and a little plug for Kyson...he is my little Angel who just sits by me and watches. He wants to get in so bad. Next year maybe Kyson! Hidden just a few minutes away from our house is this pond that we love to go and visit. We usually go to feed the ducks, but one afternoon we tried doing some fishing and taking the kids out on a raft. It was a lot of fun! It is something we'll have to do again! Grandpa Bill helping them fish. Just hanging out being cute!